FROM BROCHURE SITE TO LEAD GEN SITE. In the last couple of years, changes in the healthcare industry radically transformed customer expectations for organizations like On Lok, a growing non-profit umbrella organization in the Bay area. On Lok provides human resources, fundraising and management systems for multiple business units: A comprehensive health-care plan in multiple municipalities, the largest senior center in San Francisco and multiple buildings with residential living units for older adults, all geared to helping seniors live at home and in the community for as long as possible. On Lok’s websites did not meet the organization’s growing business needs anymore: High bounce rates, cumbersome enrollment processes and out of date content painfully exposed the websites’ lack of clear purpose and direction. Redesign changes would have to comply with PACE guidelines, section 508 of the Rehabilitation Act, the Centers for Medicare & Medicaid Services (CMS) and the California Department of Health Care Services, and provide multi-language support (Chinese-Traditional, Spanish and Vietnamese). Transform a static brochure site into a dynamic multichannel customer experience. A new website brand architecture to provide clear paths to the parent company (On Lok, Inc.) as well as its subsidiaries necessitated a re-architecture of content and navigation from the ground up. A “flatter” architecture was needed to reduce clicks to important eligibility information and streamline enrollment processes and conversion/lead generation. 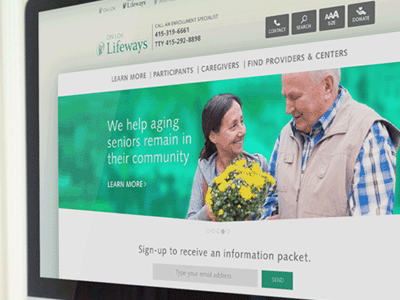 We delivered cohesive, responsive user experiences across multiple websites that streamlined lead generation and enrollment, informed consumers about the On Lok portfolio of services and drove donations. On Lok could again demonstrate market leadership internally and externally and support the business as it continues to grow new business units.